New York: Soho Press, 2000 (hard cover). 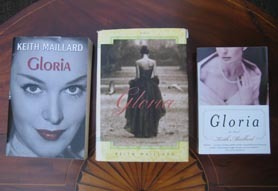 I was surprised when Gloria turned out to be my most commercially successful book. During the eight years I was writing it, I sometimes wondered who on earth would want to read a long, dense, highly detailed novel about a country club girl in 1957—and it’s true that some people don’t care for it much. The story doesn’t seem to resonate with women Gloria’s age (maybe because they lived through the 50s once, they have no desire to live through it again), and men sometimes find the subject matter unendurably girly, but many young women have loved the book passionately and sent me emails telling me so. I’ve received more fan mail for Gloria than I have for all of my other books put together, and I deeply appreciate it. While I was researching Gloria, I talked to many women who had survived the 50s. I also read fiction written for girls, fashion magazines, girls’ magazines, “how to be a girl” books, high school home economics texts, social histories, memoirs, biographies, and autobiographies. I tried to take all of this information personally—as though I were Gloria, living in her time, as though it all applied to me. I wanted to immerse myself in Gloria’s world, see everything through her eyes. Having corrected misspellings found in the HarperCollins Canadian edition, the Soho Press edition (New York) is the definitive text. 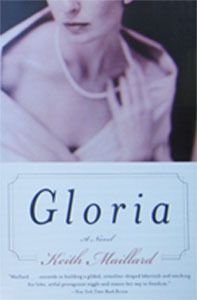 Gloria was short-listed for the Governor General’s Award in 1999. It is out of print. Gloria liked the cool, shadowless north light in the guest room so much she was reluctant to dispel it. The only mirror was a tilting, full-length one; she wondered if she were the first girl who’d ever looked into it. She wished she had a formal—wearing a formal would have been really witty—but she didn’t, so her midnight-blue Traina-Norell would have to do. She’d drunk enough wine to feel a pleasant fizz in her brain. Maybe she could write off her strange mood to a few alcohol molecules. She tilted the mirror back to favor her face; even with no more light than the soft, flat glow from the window, she could, if she bent close, do her makeup perfectly well. For the two-person masquerade in which she was about to assume a starring role, she wanted to be genuinely masked, so she sponged on a thick layer of foundation, then painted onto that primed, empty canvas the image of a sophisticated grown-up lady from a Vogue cover, stopping just short of parody. She hooked herself into her waspie, put on her underwear and hose—and paused, aware of something going on in a dim, far corner of her mind. Then she was aware, suddenly, of herself in this particular room, and aware with such an intensity it made her feel as though she must spend the greater part of her waking life sleepwalking: the way the light fell right now—the muted, green-tinted colors it created—and the calling of a bird, the sound of soft footsteps in the house, a hint of a breeze through the screened window tickling the hair on her arms; and the weight of her body flowing down through her hips into her legs and feet, the immediacy of the sensation of the thick nap of the rug felt through the slippiness of her nylons— The fear of death struck her. Oh, she thought, how could this elaborate, intricate, wonderful web of interconnections ever be extinguished? She stepped into her nylon half-slip and her crinolines. She put on her Traina-Norell and zipped it up. Oh, her wretched straight hair; she needed some big, bold earrings to take the attention away from it. She looked in her jewelry box, selected pearl dangles and clipped them on. She stepped into her opera pumps, pulled on her gloves, added a diamond bracelet to her left wrist. She straightened the mirror, studied herself, and was pleased: she looked every bit as wittily artificial as she’d wished. She drew herself up until she found that crucial inner edge she always needed before she made an entrance. As she stepped into the hallway, the magnificent smell of the cooking chicken reminded her she was hungry again. Placing each foot carefully onto an imaginary line stretching before her, she walked into the living room. Professor Bolton was sitting in one of the big chairs, reading—wearing a tuxedo and, of all wonderfully ridiculous things, patent dancing pumps. He looked up, smiling, and watched her cross the room to the sound of her rustling crinolines. I bought a copy of “Gloria” when it was new, at a Brentano’s store in Memphis. I got through college on Michener and James Clavell. Somewhere along the line, I really branched out! My wife, whom I can hardly get to read anything–she falls asleep too early at night to read very much–also loved it. I am presently finishing a novel set in my hometown of New Orleans. It is a “coming of age” story about high school sweethearts who are separated, but come back together decades later. I believe New Orleans is an excellent setting for a novel, but has not been used very much. The girl in the novel–their high school years are in the 1970s–makes plans to attend several “formals” which include shopping trips with her mother for her formal attire. I have referred back to “Gloria” several times for inspiration. I want the scenes to which I’m referring to be irreverent, but also informed and authentic. They won’t be anywhere near as intricately developed as yours. I have prior experience in journalism. Most of my working life has been in business, however–I was in corporate marketing at Fedex for several years. I do not have an agent at this time. I am attempting to approach the task of gaining representation from the point of view of achieving commercial success in the modern digital world of literature–and marketing! If you have any words of advice, I’d love to hear from you. But I did want to say that “Gloria” was a pure joy, and that the book is now, several years later, lending me some creative support. Hey, Reid, thanks for writing to me. I really appreciate it when people take the time to do that. I’m glad that you and your wife liked Gloria and especially glad that it’s an inspiration for you. I agree–New Orleans would be a great setting for a novel. Advice? Getting an agent can be harder than getting published. 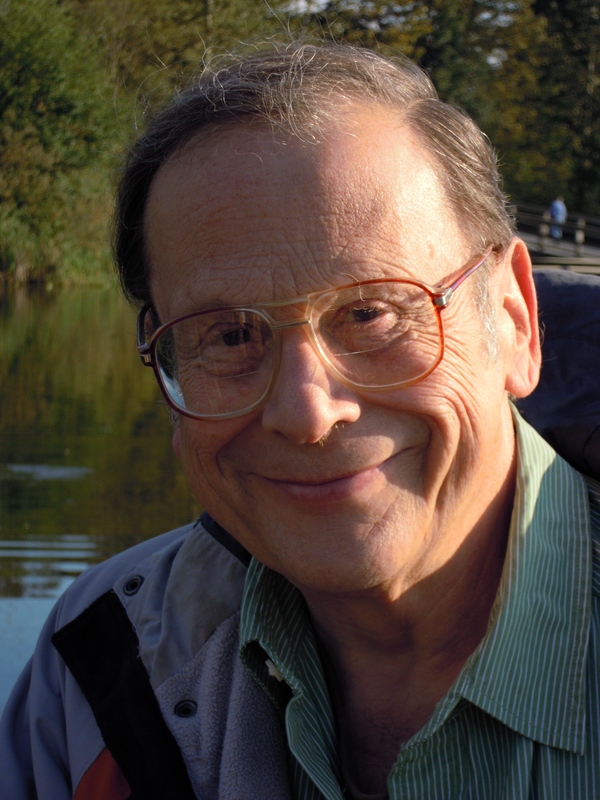 As to the writing–persistence pays off. Let your story carry you. Good luck. I bought the “Clarinet Polka” for a dollar. Figured it would be something to possibly read if I ran out of good books. I finally got around to reading it and discovered one of my favorite authors ever! I am now working my way through all of your novels and like each one more than the last. Gloria will be my next. I am so looking forward to it. Thank you for great books! Thanks for writing to me. I’m really glad you like my work. Let me know what you think of Gloria.